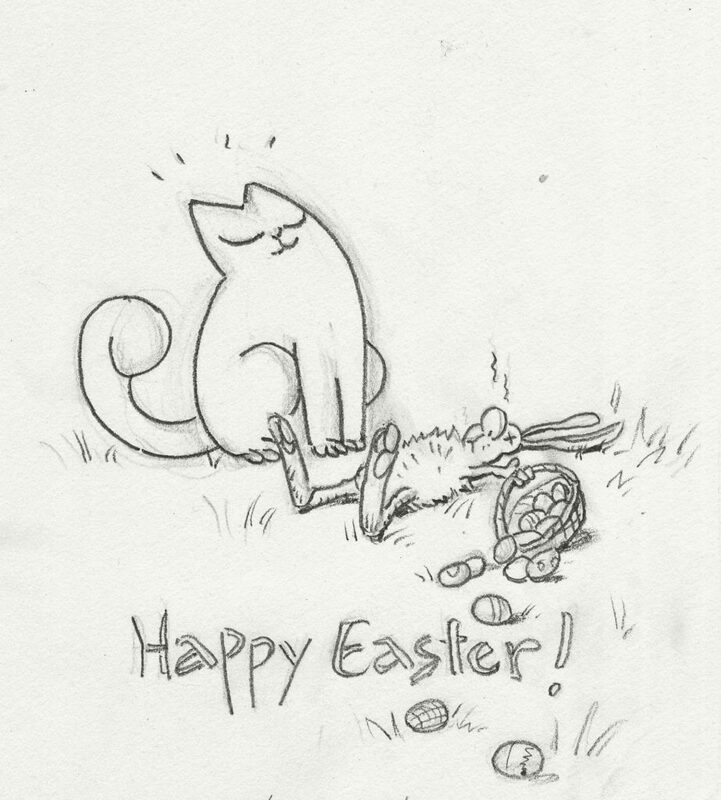 My wife Cathy drew this somewhat grisly Easter gag featuring “Simon’s Cat” bursting with pride at his “catch”. If you haven’t seen the “Simon’s Cat” internet cartoons, head over to You Tube and search for them. They are all created in England by a chap named Simon. He writes them and does all the voices. They are animated on tablets by a small crew of young English ladies and gents. Cathy loves to see Simon’s cat and the kitten wreck the house in every episode. The latest one has Simon’s Cat scooting over a freshly waxed dining room table. It’s rare to see such split-second timing in computer assisted animation, and all the comedy comes from the visuals. They use a system called TV paint. Krazy is from 6-28 to 7-3-1943 in this group. I’m not sure if this is the first appearance of Dr. Y. Zowl in the 6-28 or not, but Garge milks the name for all it’s worth. The Coconino stage is in clear evidence in the 7-2 as Krazy goes through a series of alphabet puns, only to be pelted by vegetables, bricks and bottles from the audience, while Offissa Pupp (?) cringes in the orchestra pit. In the Krazy dailies from 7-5 to 7-10-43, Offissa Pupp breaks the fourth wall in the 7-5 as he chases Ignatz clean out of the “picture”. 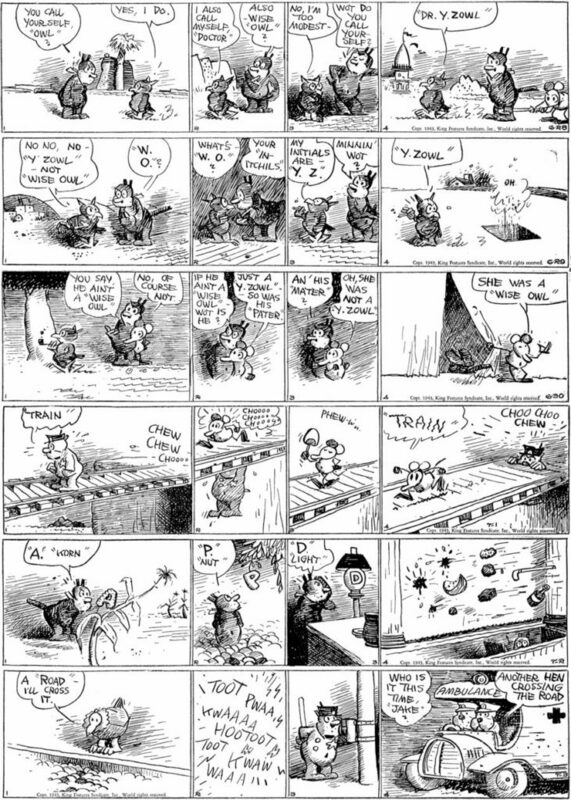 The Coconino stage makes an encore showing as Ignatz falls through a trap door in the 7-10. The drawings of Krazy continue to devolve, in the 7-10, note how strangely eerie the Kat’s eyes look in panels two and three. It puts the Kat into an angry and almost haunted mood leading into the play on words in the fourth panel. 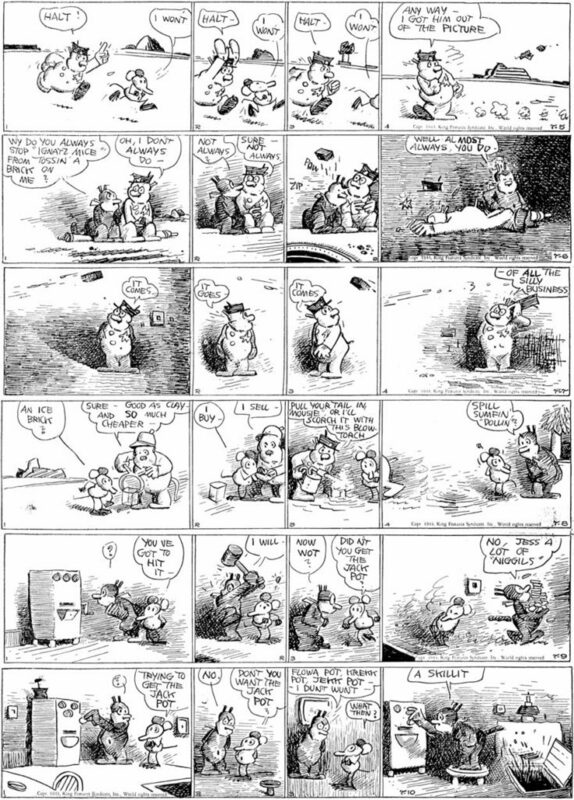 I also admire how Herriman works Krazy’s right leg into the shadow behind him in the second panel of the 7-9, as he anticipates hitting the vending machine. This is a “bonus” post, courtesy of Cathy’s drawing, so we will continue Myrtle and Felix next time. We cats thank you for reading. You are currently browsing the Mark Kausler's CatBlog blog archives for April, 2018.